In recent years, the Asscher cut has exploded on the market, with a host of celebrity engagement rings putting the cut back in the public eye. But what makes it so special? The Asscher cut is similar to an emerald cut with its step faceting, but notable for its greater degree of brilliance. In contrast to an emerald cut, an Asscher cut has larger step facets, a higher crown, and a smaller table. 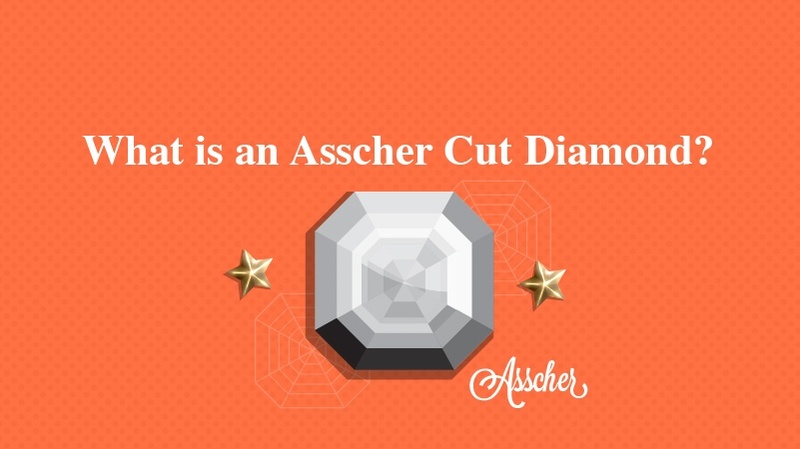 This allows for more of the raw diamond to be maintained in cutting, leading Asscher cuts to weigh more. The cut has 58 facets and a wider set than an emerald cut, which gives the diamond a square shape. Today, a variant on the original Asscher cut exists in the royal Asscher cut, which has been modified to increase the stone’s brilliance. A Royal Asscher cut has 16 more facets than the original Asscher cut’s 58, which allows it to catch more light. It also has two additional rows of eight facets each on the bottom of the stone, as well as narrower rows overall, which has made the cut more dynamic, while still maintaining its classic and unique look. The Asscher cut was first created in 1902 by Joseph Asscher, head of the Asscher Diamond Company founded in Holland in 1854. The design was an instant classic, with its symmetrical, architectural style acting as a natural complement to the Art Deco trend that would come into vogue in the 1920s. The Asscher cut fell out of style on the heels of the Great Depression, as jewelry became unaffordable, and the Asscher Diamond Company was forced to halt production. 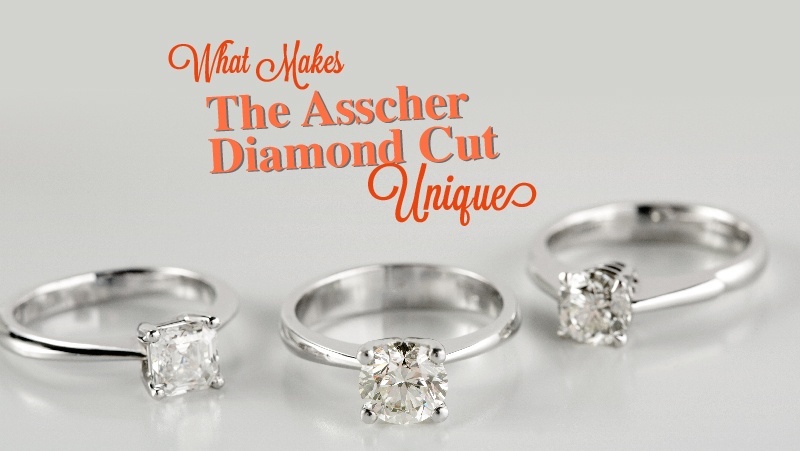 Once the exclusive domain of the Asscher family, the cut fell further into obscurity during World War II as, sadly, the Asscher family and their polishers were rounded up and interned in concentration camps. 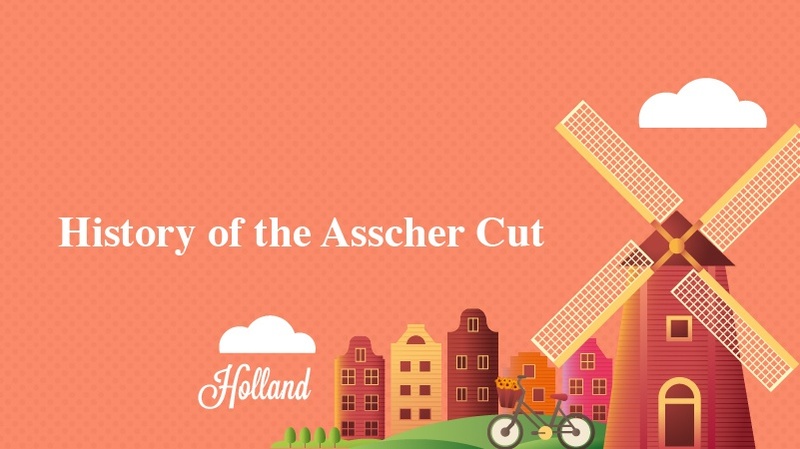 Following the war, only ten members of the Asscher family and fifteen of seven hundred polishers survived, but they returned to the Netherlands determined to restore the company to its former glory. In 1980, Queen Juliana of Holland granted the Asscher Diamond Company a royal title, making them the Royal Asscher Diamond Company. Visiting the GIA’s International Gemological Symposium in 1999, the Asschers realized their cut was still quite popular in the United States and returned home to develop the Royal Asscher Cut. Today, both are popular, but the Royal Asscher Diamond company remains the only company allowed to use the Royal Asscher cut. Celebrities have helped to popularize the Asscher cut since its inception. 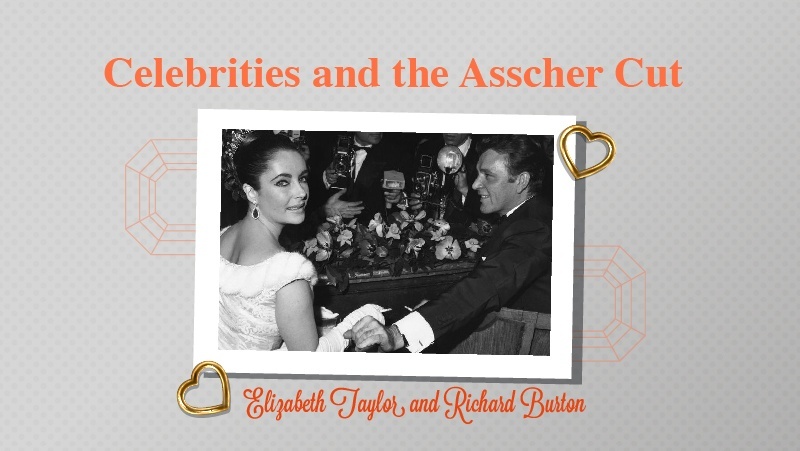 The most famous Asscher cut diamond of all time is perhaps the Krupp diamond, now also known as the Elizabeth Taylor diamond, which Richard Burton gave to Taylor during their marriage in 1968. Taylor famously wore the diamond as a ring and. throughout her life. cited it as one of her favorite pieces of jewelry. Since then, the Asscher cut has become a popular style for celebrity engagement rings. Reese Witherspoon’s first marriage to Cruel Intentions co-star Ryan Phillippe was marked by a 4.5 carat Neil Lane engagement ring. Coldplay’s Chris Martin proposed to ex-wife Gwyneth Paltrow with a pink-hued Asscher cut diamond surrounded by a micropavé frame and set on a double band. Though known for his edgy style, Pete Wentz proposed to Ashlee Simpson with a traditional ring, selecting an Asscher cut diamond in a pavé diamond frame that gives the ring a classic glamour. Similarly, Kate Hudson wore an Asscher cut diamond in an Art Deco setting while married to Chris Robinson. The cut is a favorite among both trendy celebs like Jessica Alba (who sports a 5-carat Asscher cut diamond from husband Cash Warren) and those with a more quirky style like Zooey Deschanel, whose 3-carat Asscher cut diamond from Ben Gibbard is a perfect fit for her vintage, feminine flair. It’s not restricted to rings, either. Julia Roberts caused a bump in demand for the Asscher cut when she wore 10 carat Asscher diamond earrings to the 2003 Oscars. With so many celebrities modeling the Asscher cut, it seems like the possibilities for an Asscher cut diamond are endless. But what is the best choice for an Asscher Cut diamond to showcase its brilliance and shine? Many would argue that a vintage or Art Deco style is the most fitting for the Asscher cut, as that style is what led to its initial popularity. An Art Deco setting, with its use of symmetry and geometry, naturally complements the architectural design of the Asscher cut. Most importantly, you must pick a style that helps the Asscher cut stone catch the most light. For this reason, a prong setting is recommended over a channel or bezel setting because it allows the stone to sit elevated from the band and finger. A four-prong setting is quite popular, but be sure to select prongs that are not wide enough to obscure the iconic and unique corners of the Asscher cut. Pavé settings are also quite popular for Asscher cut diamonds because it allows the central stone to maintain that pronged elevation, while placing it on a diamond-encrusted band, increasing the total sparkle and light reflection across the ring. For an Asscher cut diamond, many prefer a solitaire setting because it allows the uniqueness of the cut to speak for itself. However, an Asscher cut also looks beautiful as a central stone nestled among other diamonds or gems in a three-stone or five-stone design. It is best to flank an Asscher cut diamond with baguette or princess cut stones because they nestle securely against the flat edges of the Asscher cut stone. 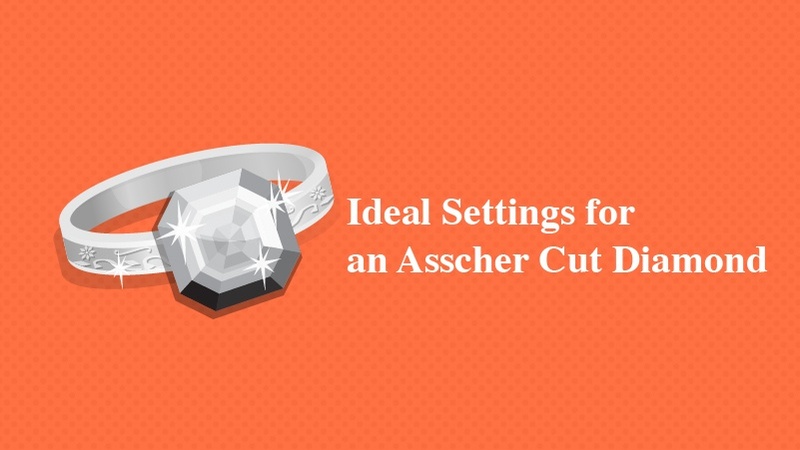 Finally, when it comes to an Asscher cut, many opt for a halo setting. The flat edges of the Asscher cut stone provide a natural border for a halo of diamonds (or any other gemstone). For those who select an Asscher cut diamond of a smaller carat, the halo setting can also enhance the brilliance and give the appearance of a greater size. No matter which of these settings you select, the Asscher cut diamond is a unique entity that has risen and fallen in popularity with the turbulence of the twentieth century. It lends a bride a classic vintage flair while also making her appear one-of-a-kind since it is far less common than a princess or round brilliant cut.